Hours: By appointment only as preparations are made for the grand re-opening. Hours: By appointment only as preparations for our grand re-opening celebration. Call 607-349-8988 for appointment. The Historian’s office is located in the Kattelville Schoolhouse located on the corner of River Road and Patch Road. It is the repository for local history records. Here you will find surname files, family folders, census, and cemetery records. There are also maps, genealogy and books relating to this area. You will find computerized listings for all local cemeteries. We have a wealth of information, names and photos of our one-room schools. You will also find pictures and histories of our churches and social groups. Whether you are updating your family history, looking for beginner help in searching for your ancestors, researching a local historical event or just satisfying your curiosity. You will find what you need here. We are especially proud of our photograph collection. all cross-referenced for easy access. If your family lived in our town, we probably have their picture. 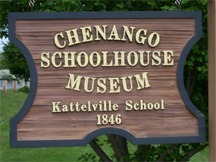 Our museum is the former Kattelville one-room schoolhouse, which was once located on Route 12. It was relocated near the Chenango Forks Schools on the corner of River and Patch Rd. Built in 1846, the building is mostly original. Although the interior is new, it is not only used as a local history center and historian’s office it is used as a museum. Many classes from local schools have visited to learn more about out town’s history. Our ever – changing displays are always interesting for all ages. The Chenango Schoolhouse Museum is a picturesque building surrounded by beautiful flowerbeds and adjacent to the historic Handy Cemetery. Resting place of a Revolutionary War veteran. The museum is open free of charge to all. If your school class, civic organization, church or social group would like to visit, please call. We will gladly find and plan a program especially for you. Our past programs and displays have featured general stores, antique farm equipment, vintage clothing, one room schools. Revolutionary War, miniature villages, railroads, road-building, collections, Civil War, antique toys, Victorian Christmas, bread-making, soap-making, and many more.